Codeigniter is PHP Framework which is built on the top of the MVC (Model-View-Controller) development pattern. 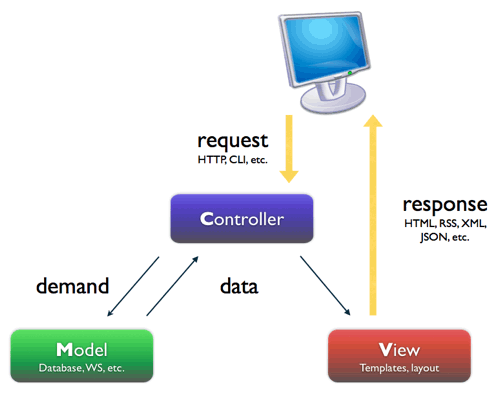 Model-View-Controller is a software approach which separates application logic from presentation. Since the presentation is separate from the PHP scripting here, it permits the web pages to contain minimal scripting. Model- The Model consists of the data structures. In a way These typically contains the sets of the functions that helps in retrieving, inserting and updating information in the database. View- The view is the information that is being presented to the user. A view in normal case is a webpage, but in case of Codeigniter, it can be a page fragment like header or footer, or it can be any other type of page like RSS as well as for performing UI. Controller- The controller implements the logical implementation for writing the programme and creating the webpage. The controller serves as an intermediary between the model and the view and any other resources needed to process HTTP request and generate a webpage.